This evening was planned as a roundtable discussion between the Deputy Mayor Vienna (who is also a member of the Austrian Green Party) and representatives of the HK Government and various non-governmental organizations. The panelists debated on how the cities of Vienna and Hong Kong can improve their resilience, mitigate and adapt to the effects of the global climate change, as well as how to create public acceptance for climate change objectives. In his introduction, Prof. Hess pointed out that concerns about global climate change are a major driver for current urban development planning worldwide, especially since the recent signing of a binding global agreement at the Paris Climate Conference (COP21) to keep global warming under the critical threshold of 20C. There seemed to be enormous differences between Vienna and Hong Kong in their reaction to international climate protection demands. In her presentation, Mrs. Maria Vassilakou explained Vienna’s urban development vision in the context of sustainability and resilience goals to be achieved. She stated that the city of the future needed clear vision, strategies, and strong leadership open to citizen participation. Vienna sees the issue of ‘quality of life’ as tightly connected with sustainability planning. A ‘happy city’ would come about only if it could offer a clean and resource-efficient environment for all. Vienna’s 1.8 million inhabitants already live in a city which reserves 50% of the land surface for green spaces. 40% of all flats are already connected to energy-efficient district heating systems. The average greenhouse gas emissions per capita currently stand at 5.8 t p.a. It is envisioned that the greenhouse gas emissions will be reduced by 80% until 2050, which requires a reduction of 40% in primary energy use. 85% of all movements (trips) in the city should become eco-friendly (i.e. by public transport, walking and cycling). Vienna’s infrastructure and utility companies are owned by the city, which makes sustainability planning possible and more efficient. Vienna tried to be a ‘learning city’ by implementing measures of ‘smart governance’ and increasing citizens’ engagement in long-term planning. Newly developed districts such as ‘Seestadt Aspern’ and ‘Nordbahnhofgelaende’ are characterized by large proportions of reserved green space and mixed-use planning concepts. The close proximity of workplaces and housing should bring down significantly the number of commuting trips. At the same time, the Vienna public transport systems will be enlarged, while private car use is to be discouraged. Citywide speed reductions for private transport have been proven helpful to reduce volume of traffic and emissions. Vienna already offers a yearly ticket for the unlimited use of the entire public transport network at a nominal cost of 1€ per day, which has become very popular with city residents. Equally popular have been temporary or partial street closures which allow citizens to appreciate car-free environments and new usage patterns of streets, e.g. for neighborhood festivals. The new districts generally will not be accessible to car traffic, and the number of parking spaces in the city is to be reduced. Green corridors for walking and cycling need to be established throughout the entire city so as to link all green spaces and parks (‘green archipelagoes’). The city currently invests 10 million Euros per year in a cycling route network, which will eventually have an overall length of over 1,000 km. Opportunities for urban gardening and community farming are on the rise, following extensive citizens’ consultations in development areas. In addition, the city now promotes car & bike sharing on a large scale. Overall, Vienna should become a ‘walkable city’, with large-scale ‘strolling promenades’. The concept has already been seen as useful also for tourism development. The roundtable discussion started with a debate on existing environmental targets in Vienna and Hong Kong. Mr. Lai called it a big failure of the HK government that the city has not formulated any climate protection goals at all. Although among the wealthiest places on earth and an enormous greenhouse gas emitter, it is in fact not obliged to do so. As a SAR of China, it figures officially as a ‘developing country’ with no international obligations whatsoever. Dr Wong, however, remarked that sustainability goals are already worked into local environmental protection measures (e.g. new district cooling systems) because the territory would soon have to follow ambitious guidelines drafted by the national government anyway. By contrast, Vienna (as part of the European Union) is now committed to COP21 goals and is in fact far ahead of the current level of EU commitments. As a federal state in its own right, Vienna can set its own targets. According to the Deputy Mayor, all levels of the city administration have been asked to propose energy saving measures as a matter of principle. 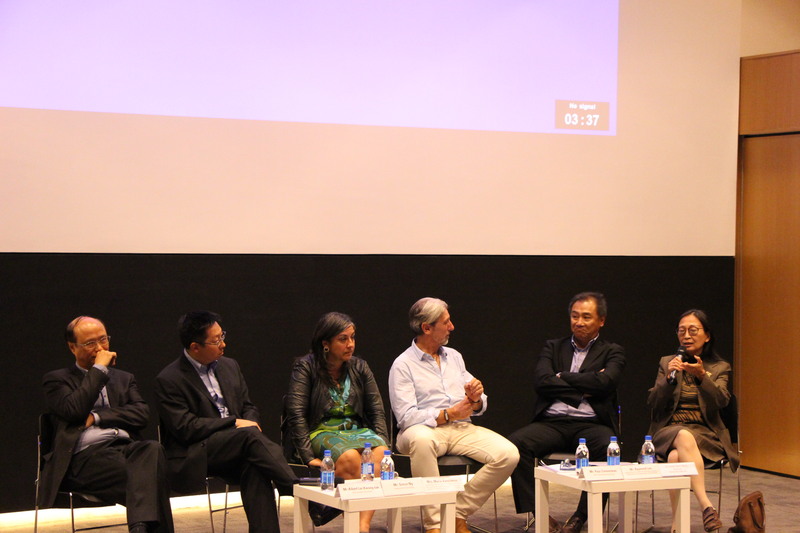 Several panelists were critical of the still insufficient targets of greenhouse gas emissions reduction. Mrs. Vassilakou responded that successful compliance with COP21 requires the consent and support from all citizens. Political leaders would have to stand firm and be courageous enough to defend their goals and principles so as to convince a majority of citizens over time. At the same time, Vienna also had to ‘create business cases’ in favor of climate protection goals. She cited as an example the Viennese practice of inviting citizens to become shareholders in solar power plants. As the shares in such publicly owned ventures have a guaranteed return for at least 10 years, the popular demand has been high. Similarly, it must be possible to feed surplus electricity generated in private houses back into the grid at reasonable prices, thereby turning greenhouse gas reduction into a business proposition for citizens. Dr. Vivian Wong opined that this should also be possible in Hong Kong once the duopoly of energy providers in the city would come to an end. It would be possible to provide 45% of urban energy needs by rooftop solar panels. Mr. Simon Wong maintained that energy conservation targets should be set very high also in Hong Kong to put pressure on the further expansion of public transport systems and other ‘walkability’ measures. Following Mr. Raymond Lee however, the problem in Hong Kong is that buildings (rather than transport) consume 90% of the city’s electricity. The Government was working on schemes to increase the energy efficiencies of new buildings, but he did not want to reveal details of the internal discussions at this point. Dr. Wong added that it was necessary in both cities to bring enterprises ‘on our side’, primarily appealing to corporate social responsibility and the positive image to be gained in public perception. From several remarks by panelists it appeared that the general HK public as well as the business sectors would in fact welcome greater attention to environmental policies. It was remarked by several panelists (as well as members of the audience) that the HK Government currently is too inactive. There was not enough coordination among different departments due to an overall lack of political leadership in favor of sustainable urban planning. The Government was also too cautious with respect to ‘empowering citizens’ and instead relied too heavily on executive-led decision-making without prior consent in society. One member of the audience concluded that there were indeed many good ideas in Hong Kong to improve the environment and simultaneously live up to it moral obligation to reach international climate protection goals. She maintained that while European cities like Vienna have a clear vision of the future, the HK Government does not. At least, it does not, for the time being, show the strength and heart to develop consistent sustainability policies.